After the successful exhibition on Quentin Blake, The Hague’s Museum Meermanno now offers an exhibition on art nouveau book designs. Examples range from the English Arts and Crafts Movement to Dutch Art Nouveau. The focus is on books as works of art and specifically, works by three Dutch designers. 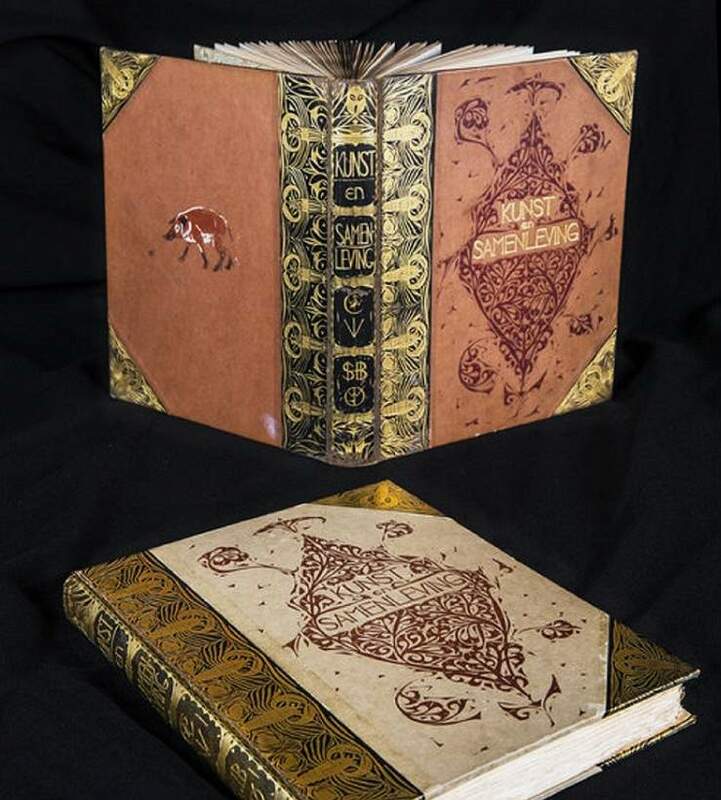 The exhibition “Exquisite Bindings, Art Nouveau books by van Dijsselhof, Lion Cachet and Nieuwenhuis” is one of several temporary exhibitions. Visitors find it on the period building’s ground floor. The first room explains what inspired the Arts and Craft Movement and Art Nouveau. Here are examples of books taking inspiration from nature, as well as examples inspired by traditional crafts like Indonesian Batik. Apart from Dutch artist Jan Toorop, attention is payed to William Morris and his Kelmscott Press. From the second room, the focus shifts to three Dutch designers. Between 1880 – 1910, these pioneers not only created unique books. They also designed furniture for the Amsterdam firm E.J. van Wisselingh & Co and ultimately ship-interiors. Of course, visitors come across furniture including special display cases. A few of these were designed for Dutch royalty. But special books, covers, illustrations and types remain the most important contents of the exhibition. A room is dedicated to each of the three designers. They are Gerrit Willem Dijsselhof (1866-1924), Carel Adolph Cachet (1864-1945) and Theo Nieuwenhuis (1866-1951). Though all three worked as book binding designers, they never limited themselves to just book design. The exhibition points out they also designed wall paper, bank notes, carpets – and much more! Visitors come across examples of Nieuwenhuis’ calenders. Cachet, who later added Lion to his surname, experimented with for instance batik techniques on vellum. He also created hand-coloured books. The exhibition contains objects from the museum’s extensive collection, as well as loans from the collections of the Dutch Royal Library, University of Leiden and the Royal Collection. Lectures and workshops accompany this exhibition which runs till 23rd of June 2019.